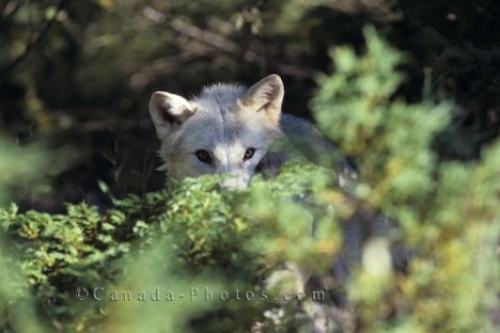 A young Arctic Wolf is still leery of his life in the wilderness and must always be sure before moving on. Arctic Wolves reside in many isolated areas where humans are very rarely seen and this young wolf wants to be sure of what he is looking at before venturing on. As he hides behind the bushes, it was the perfect opportunity to get some pictures of this cute Arctic Wolf. Picture of a young Arctic Wolf checking out his surroundings in the wildlife.